The Kramer VP-797ASV is a universal HQUltra 12-Input 4K60 UHD 4:2:0 Presentation Switcher/Scaler for HDMI, DisplayPort, HDBaseT VGA, composite, DVI-U, H.264 streaming video signals and analog audio. This product features excellent image processing algorithms that allow for high-end scaling, motion-adaptive de-interlacing and automatic film 3:2 and 2:2 pull-down correction. The HQUltra Scaling uses low latency, 4K UHD best-in-class, proprietary scaling algorithms. In addition to full 4K processing this unit uses HQUltraFast technology which switches in typically a quarter of a second, providing for seamless transitions between switched sources, while maintaining signal quality. The VP-797ASV is a truly flexible device with high-performance video input front end that allows it to accept and process a wide variety of inputs. HDCP encryption is supported for HDMI, DVI and DisplayPort video, as are computer graphic inputs in SVGA analog and HDMI/DVI digital formats. Making this an ideal presentation switcher for use in lecture halls, classrooms, corporate meeting spaces, medical and healthcare, hotel conference venues, or in networked video applications using the H.264 1080p Streaming Video Input via a network port. For outstanding image clarity, a high performance video decoder is utilized with 4x oversampling and 3D Y/C separation. The output frame rate can lock to the input frame rate dynamically without frame rate conversion in order to reduce system latency; or it can be set to a fixed output frame for example for driving basic screens which are not 50Hz-compatible. Equally the output format can also lock to an externally provided synchronization signal on various models. All outputs are active simultaneously, except in the cases where the formats are not compatible. For example, for the PC graphic formats that are not supported by the SDI standards, the 3GSDI output will be disabled. Also note that if an HDCP encrypted signal is connected to the DP, HDMI or DVI input, the HDMI and DVI output signals will be similarly HDCP encrypted and the 3GSDI output will be disabled. Additional features of the VP-797ASV include a Pan, Tilt and Zoom (PTZ) feature that allows the user to select certain regions of interest (ROI), of the input image to fill the screen and pan and tilt within the displayed image. Multiple units can work synchronously with the built-in video wall feature which allows the unit to be a part of a larger matrix configuration, 4x4, where each unit crops a section of the input video image and displays it on the corresponding projector or screen. Control for this device is achieve via the front panel display and rotary knob, or through a built-in web page, or by API interface. 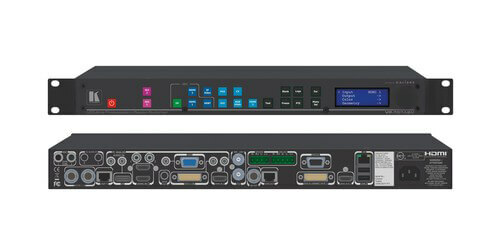 Furthermore the VS-797ASV model includes 8 stereo audio inputs and two microphone inputs with Phantom Power. An embedded audio mixer allows mixing of the mic inputs to any analog or digital audio signal. Included Accessories: Power cord, Rack "ears"